What is the Os Trigonum? 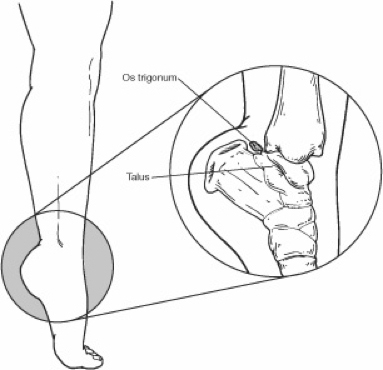 The os trigonum is an extra (accessory) bone that sometimes develops behind the ankle bone (talus). It is connected to the talus by a fibrous band. The presence of an os trigonum in one or both feet is congenital (present at birth). It becomes evident during adolescence when one area of the talus does not fuse with the rest of the bone, creating a small extra bone. Only a small number of people have this extra bone. What is Os Trigonum Syndrome? Often, people don’t know they have an os trigonum if it hasn’t caused any problems. However, some people with this extra bone develop a painful condition known as os trigonum syndrome. Os trigonum syndrome is usually triggered by an injury, such as an ankle sprain. The syndrome is also frequently caused by repeated downward pointing of the toes, which is common among ballet dancers, soccer players and other athletes. For the person who has an os trigonum, pointing the toes downward can result in a “nutcracker injury.” Like an almond in a nutcracker, the os trigonum is crunched between the ankle and heel bones. As the os trigonum pulls loose, the tissue connecting it to the talus is stretched or torn and the area becomes inflamed. Os trigonum syndrome can mimic other conditions such as an Achilles tendon injury, ankle sprain, or talus fracture. Diagnosis of os trigonum syndrome begins with questions from the doctor about the development of the symptoms. After the foot and ankle are examined, x-rays or other imaging tests are often ordered to assist in making the diagnosis. Rest. It is important to stay off the injured foot to let the inflammation subside. Immobilization. Often a walking boot is used to restrict ankle motion and allow the injured tissue to heal. Ice. Swelling is decreased by applying a bag of ice covered with a thin towel to the affected area. Do not put ice directly against the skin. Oral medication. Nonsteroidal anti-inflammatory drugs (NSAIDs), such as ibuprofen, may be helpful in reducing the pain and inflammation. Injections. Sometimes cortisone is injected into the area to reduce the inflammation and pain. Most patients’ symptoms improve with non-surgical treatment. However, in some patients, surgery may be required to relieve the symptoms. Surgery typically involves removal of the os trigonum, as this extra bone is not necessary for normal foot function. Copyright © 2012 | American College of Foot and Ankle Surgeons (ACFAS), All Rights Reserved.